Wednesday, July 2, 1913: It’s most too hot to do anything important so I need to write about the weather. Oh yes, I recollect, I did pick some cherries this afternoon for one thing. Bread: Preheat oven to 350 degrees. Grease and flour two 9 X 5 X 3 inch loaf pans or three 8 1/2 X 4 1/2 X 2 1/2 inch loaf pans. * ** Beat together shortening and sugar; add eggs and beat. Add flour, salt, baking soda, baking powder, milk, and almond extract; then beat until mixed. 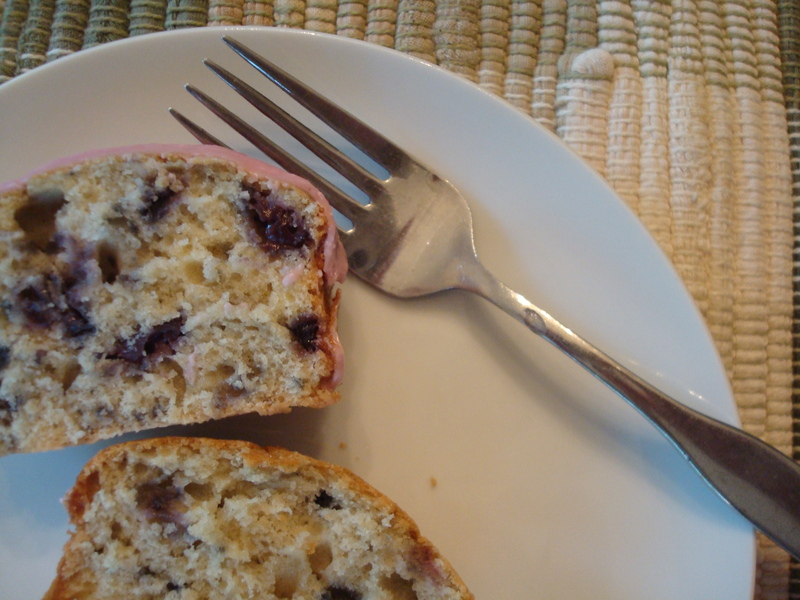 Finely chop cherries and gently fold into batter. Pour batter into prepared pans. Bake full-size loaf pans 1 to 1 1/4 hours or until wooden pick inserted in center comes out clean. (Smaller pans will take less time.) Partially cool and then remove from pans. 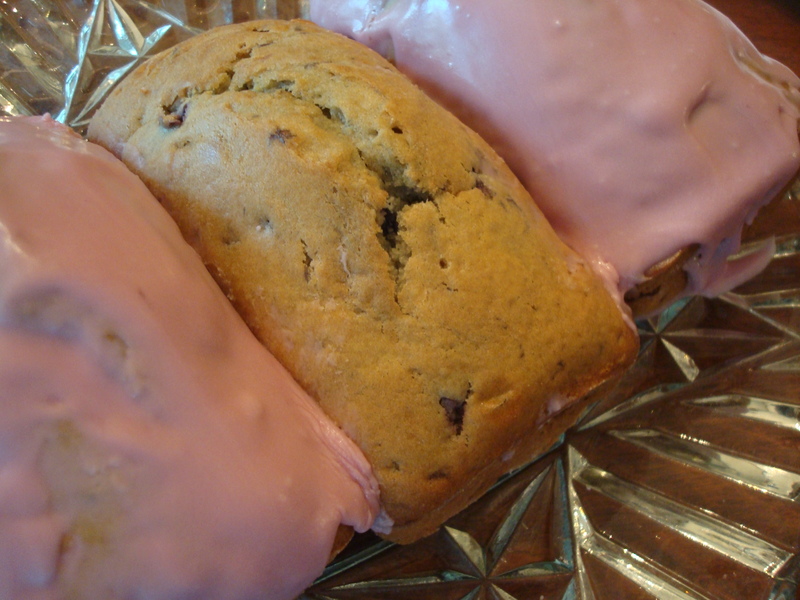 Glaze: Beat together until smooth: butter, confectioners’ sugar, almond extract, and cherry juice. Use more or less cherry juice to get desired consistency. Spread over loaves. Let the glaze drip down the sides. *I usually use one 9 X 5 X 3 inch loaf pan and three “personal” loaf pans (approximately 5 1/2 X 3 X 2 inches). **If planning to remove bread from the pans, cut a piece of wax paper to fit the bottom of each pan. Grease pan, then put wax paper into pan. Grease wax paper, and then flour pan. Thursday, June 13, 1912: I guess I’ve forgotten. 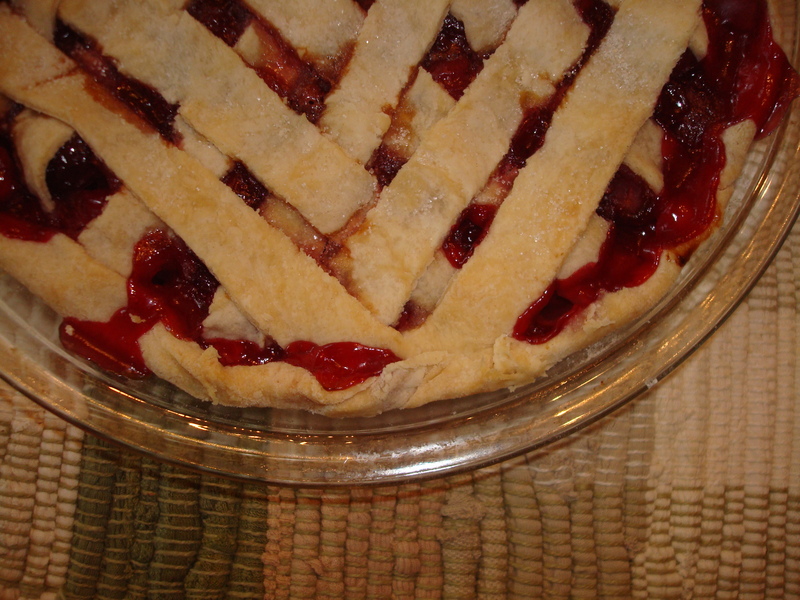 My sour cherries are getting ripe and I made an old-fashioned cherry pie. 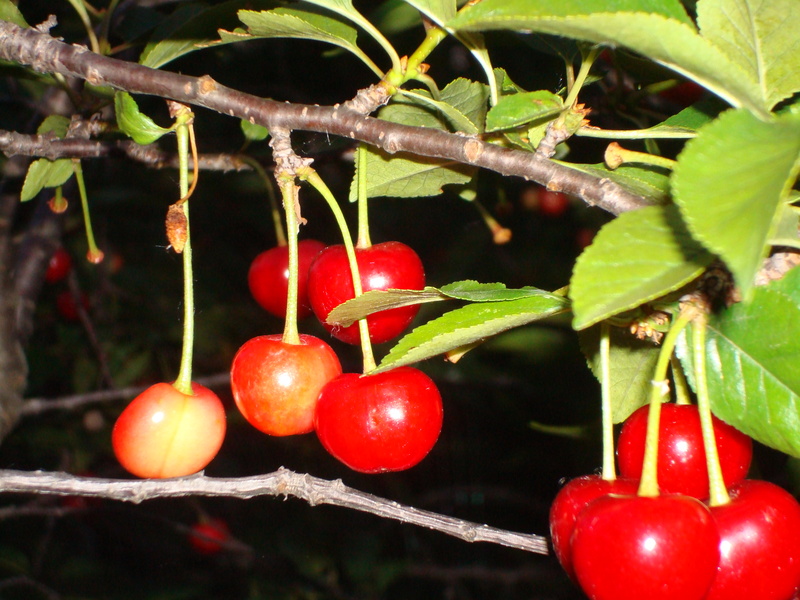 Grandma mentioned picking berries on June 10—but hasn’t mentioned cherries. I wonder if cherries ripened this early in 1912. Heat oven to 425 degrees. 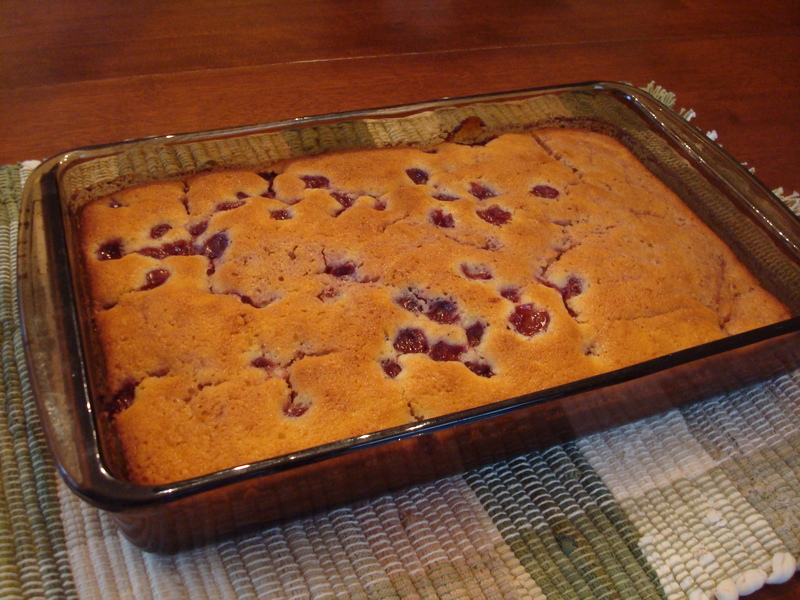 Stir the sugar, flour, and almond extract into the cherries. If the mixture is very juicy add additional flour. Turn into pastry-lined pie pan. Make a lattice top crust and flute edges. Brush crust with a small amount of milk; sprinkle with sugar. Bake in oven for 10 minutes; then reduce heat to 350 degrees. Bake an additional 20 to 30 minutes or until crust is lightly browned and juice just begins to bubble. I made my own pie crust dough using the recipe that I previously included in the post for Rhubarb Sponge Pie. I doubled that recipe since I basically needed two crusts for this pie. For the lattice top crust, I cut the dough into strips about 3/4 inch wide and laid them on the top of the pie. I try to lay every other one perpendicular to the previous one—but the lattice never ends up being woven exactly right. I never worry much about that because the pie tastes so awesome. Monday, June 26, 1911: Felt so terrible this morning, so did Ruth. Picked cherries nearly all afternoon! There were sour ones, so there was no danger of spoiling my hands to any considerable extent. How did the Muffly family use the sour cherries? In pies? . . . jam?. . . fruit compote? . . . cherry pudding? I can remember cherry pudding tasting awesome on hot summer evenings after a hard day of making hay. 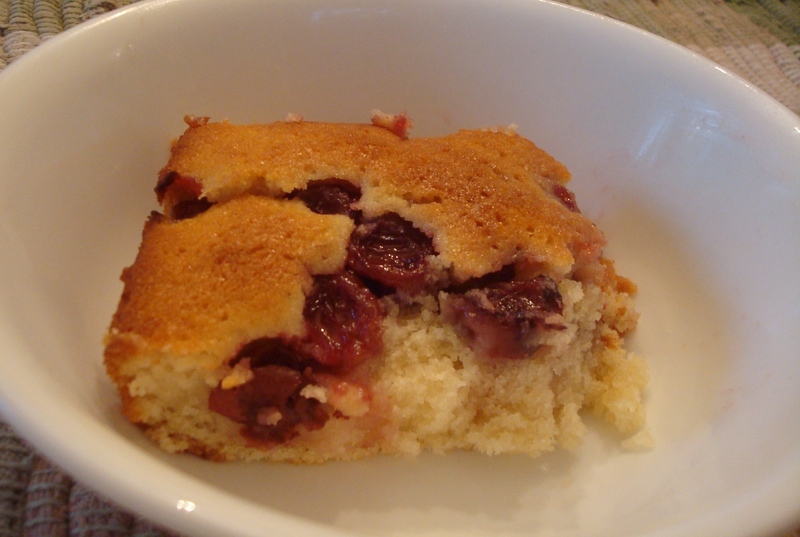 Here’s the old family recipe that I use to make Cherry Pudding. Preheat oven to 350 degrees. Put into a mixing bowl: butter, sugar, baking powder, salt, egg, milk, flour, and vanilla; beat until smooth. Pour into a 7 1/2 X 12 X 2 inch rectangular casserole dish, or similarly sized dish. Make sauce by heating the 3/4 cup of sugar, cherries (including any juice), and water. Bring to a boil; then pour the cherry sauce over the batter. Place in oven and bake for 35 to 45 minutes, or until pudding just begins to shrink from sides of dish, and the top is golden brown. When baked, cherries and sauce will be on the bottom. Serve warm. If desired, may be served with milk. *Frozen or canned cherries may be used. Do not drain frozen or canned cherries; and include juice when measuring cherries. It works okay to use a 1 pound can of cherries—there just will be somewhat fewer cherries in the dish than if fresh or frozen cherries were used. Reduce amount of sugar, if using cherries canned or frozen in sugar syrup.